Winter is so here. Are you equipped to deal with it? Duolingo's got your back. 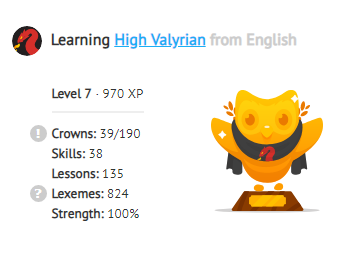 A new version of the High Valyrian course is now available—with audio! In addition to the brand new voice recordings, there is fresh new vocabulary and content added as well. Give it a try here! As you might remember, Dedalvs, the main contributor of the High Valyrian course here at Duolingo, is David J. Peterson, the actual constructor of the High Valyrian language. He built the language used in the TV show Game of Thrones based on a few sentences and words sprinkled throughout George R. R. Martin’s books. You’ll be happy to know that he is also the person responsible for the new Duolingo High Valyrian course audio recordings. We have recently started allowing contributors of courses that did not have auto-generated audio to record voices to add to the course. We are so happy that Dedalvs took charge of recording the audio for this course, making High Valyrian one of the first languages with contributor-recorded audio available to learners (the other one being Hawaiian). You can read more about the language on the wikipedia page, and also learn more about David and the course on several interviews online. Check out these recent stories on Reuters, Buzzfeed News and CBS (this one contains big spoilers for a previous season). You can also follow @dedalvs on Twitter. We are honored that Dedalvs, Amorena3 and MadLatinist have dedicated their time to share this language with us, and given us all the opportunity to learn High Valyrian and its proper pronunciation directly from David, just like the actors from the television show. Give the course and new audio a try as well, we’d love to hear your thoughts! @Vivisaurus, this is an amazing project! @Dedalvs has become a legend in the Linguistic World. I intend to conquer the tree tonight. I'm so happy LOL! "Let's get ready to rumble!" EDIT: I'm really looking forward to watching the last season of Game of Thrones. It looks like you have the highest HV level here—congratulations (and tonight? that is ambitious)! Are we required to bend the knee to Duo to be able to live, or just keep our streaks alive? like the language bird hasn't been terrifying enough already, it literally took the Iron Throne. wonder what it'll do to us next?! To everyone saying "Why are they wasting time on this conlang?" ... It takes contributors that know the language to build the course. So just because they are working on this (easier) language, doesn't mean they aren't still working on Arabic, Latin, etc. I just wonder why learners are wasting their time on a conlang when they could learn a useable language. Because to us (at least to me) it's not wasted time. I just wonder why you care so much about other people's decisions, which keep in mind, don't affect you in the least. I simply said "I wonder" and you first claimed I was "whining", then edited it to "care so much". I care "so much" that I posted one forum comment. "Why do you do x?" is the most basic, non-hostile question in the world that even a toddler might ask of you, and you went to DEFCON 2. Makes you sound extremely insecure in your hobby to be honest. Conlangs are very fun, and can be useable (Esperanto is one)! Also, conlangs tap it to anthropology and psychology; Toki Pona is a lot of fun, and helps to live more of a minimalist lifestyle. Besides, if people enjoy it, that's reason enough. To each his/her own. Esperanto was designed by a linguist to be easy to learn, using quite a number of existing linguistic roots. George RR Martin wrote a fictional language with a few handfuls of phrases in a set of books. I think the comparison is a stretch. @Alexroseajr (since the thread won’t let me reply to your comment) That enters into the matters of personal choice and I’m no one to judge here. Everybody has their own reasons to do things, correct or incorrect as they may be (Mine with High Valyrian and Klingon are family-related, for example), you can only, at least in my opinion and, as my mother says, “Pray they don’t crash headfirst into the ground” with their choices. I agree with you that learning any language improves your ability to learn other languages and helps you to understand the methods you need, gives you a deeper understanding of grammar etc. But I lament that someone wouldn't just do this by learning another spoken language. If they chose any indo-european language, it would be easier than learning High Valyrian because it would in some ways resemble their own language. And it would be vastly easier to find resources, speakers, pronunciations, books to read, films, immerse them in a foreign culture etc. It just seems closed minded to be like "I'm gonna learn a language! I have the whole globe to learn from! What shall I choose? How about an invented language by some english speaker"
Imagine being so closed to the rest of the entire world that you would rather learn a language from a series of books that realistically isn't even going to be completed, over being able to connect with other human beings. Yeah, I can totally see why you'd learn a conlang like interslavic or esperanto, or a "dead" language like latin or ancient greek, where you're building yourself an ability to read many tongues or a base on which you can more easily learn other languages. To be able to communicate/understand media with people in their native tongue. To build a foundation on which to learn other languages. To learn general principles of grammar and skills to aid with learning another language. To have a secret method of communication with a friend/partner in public. High Valyrian can't satisfy point 1 or 2 because it's not a native tongue, and while it may have its own grammar it's unlikely to be as useful as learning a slavic tongue, for instance, where the grammar is applicable in many places. I understand that it could be fun, however.. can it really be that much more fun than completely indulging yourself in a real foreign culture, being able to fly to those countries and speak with their natives, and consume their media? I don't understand how, given that hundreds of languages exist, someone would go to High Valyrian before they learn an asian tongue, or a baltic tongue, there's so much world out there. It honestly seems pretty insular to pick a made up meme language over learning about an actual rich foreign culture. As for point 4, High Valyrian probably actually is a great candidate for a secret language, but only if your partner was equally as enthused and willing to learn that language as you. And at that point you could just learn a rare language instead and have something that no one will understand but which is usable if you go to the right country. Everyone in the comments here seem very defensive, but like.. if you're going to do something for a hobby, and really dedicate time to learning a language, it makes absolutely no sense to me that you wouldn't just find a real language you prefer, and it seems closed minded to me that someone would prioritise a fairy tale language over ever single culture on earth. In mine, no knowledge is useless tbh. Even with languages like this, the very same process of learning can be a gateway to learn other languages that are more “useful” because those who learn them discover they are good at learning languages and discover they like the process of doing so. (A preteen obsession with Lord of the Rings did help me in establishing a love for language learning, along with other things, and here I am now, speaking six languages, and actually writing to you in my second one). Then again, this is just my opinion. I’ll probably won’t make you change yours, as you won’t make me change mine. Guess we’ll have to agree to disagree. For someone who laments the "bad time management" of others, it's interesting to see your lengthy replies here. If this is how you choose to spend your free time, fine. Let's not pretend that free time must always be spent on higher pursuits. I'm learning HV because it's fun and helps me to enjoy the series even more. I study other languages because it's fun and practical. I do other things in my spare time for various reasons, and they're not always fun things or practical things. Devoting a few minutes here and there to HV is in no way detrimental to my other activities or responsibilities. There are plenty of things I don't like or understand, but I don't try to convince people that their preferences are inferior. We're defensive because you accuse us of being narrow-minded based on a single piece of information. Did you fully read my post? HV has little impact on the other languages I'm learning or anything else I'm doing. Not everyone has the physical or financial capability for foreign travel just to chat with locals. Should I stop studying because of those limitations? What would be a better use of my time, in your admittedly unimaginative opinion? So you came here to discuss but not convince. And because our reasons aren't good enough, you continue to judge us as insular. What are you hoping to accomplish? there's a difference between having a discussion on a forum for a combined total of 5-10 minutes where I potentially hear a good reason for something I never thought of before, and learning an entire language written for a tv show. And I said I lament that people would rather choose a fantasy language spoken for probably total <10 minutes on one tv show rather than immersing themselves in another culture, of which there are many very rich ones. I love GoT, but I can't imagine wanting to learn a GoT made up dragon rider language above being able to actually go to Egypt or Norway or China or Russia and speak the language with the locals. That is very impressive. Well done, Duolingo and course contributors! I’m not learning it, but I’m excited, because it is a relatively new language getting a lot of support. It is also a great motivator for many people. Duo on that throne is just-- ADORABLE hahahaha!! Thank you so much! So exciting to get three new trees this week. GET HYPE! Yay! I tried the tree again yesterday and was impressed with all the improvements, so I’m definitely getting on with it again. I am waiting for Hawaiian as well! Will the option of adding contributer-generated audio recordings be extended to languages with TTS audio? Most of the courses have very good TTS that is an essential and well-loved part of Duolingo, and it should stay that way. But there are a few sentences with some very unfortunate errors that contributors did not have any means to fix. This could be a way to remedy that issue. And finally, are you considering the option of giving contributers the possibility to replace every sentence audio with a recording made by a speaker? I am wondering if that might be too resource-intensive. I dont do this language but think this is so cool. Thank you so much, i am actually planning to conquering the High Valerian tree! I just love how a Game Of Thrones ad is the only one that shows up on this page. ;P lol! Though many people say it is hard?? It's complex, but that doesn't mean it's hard. I think the tree does a very good job of explaining everything you need know, and if you don't understand, you can go to wiki.dothraki.org for more information on both HV and Dothraki. That's a point: I wonder if they've thought about adding Dothraki to Duo, as well. Yayy! I give support for Duo and team to help advance a 'how-to', how a language is constructed -so as to make it work well with pleasing effects!! just as for how a thing/bridge/plane/boat/engine/rocket/spaceship is constructed -better and better. Extra extra extra cheers to counter those that put down or envy. Yes to language engineering and language appreciation. I get to meet @Dedalvs tomorrow! I don't think I've ever been more excited to meet someone in my life. Hey, just a reminder keep your Duolingo streak! If you don't Duo the Owl will kidnap your family and slaughter them. Last night my parents were taken away and I am writing this at gun point. Cool addition. I know a lot of people have been waiting for this. Shout out to all the team working on this course! It is very much winter in Westeros. Spoiler alert: not everyone lives in the same part of the world as you. Maybe it's still winter in Alaska, northern Russia and a few other places? It depends on which hemisphere you live in: it's Spring in the northern hemisphere. So, this is where my "Plus" subscription money were wasted? On this useless fantasy world movie language. not wasted as some are really into it and if people want to learn this, why not. Because the only real world application is to "geek out" with other fans, to make yourself feel superior, part of the "in group". I get it. Fans tend to be "geeks" (as am I), and geeks are shunned and made to feel bad about themselves, and if this makes them feel better, I guess that's great. But it's a nasty cycle. Why buy into it? Instead, why not learn a minority language in your area and meet people who are sidelined and make them feel more welcome? Why does it have to have a "real world application"? I'm learning it because it's fun. I'm also an introvert who doesn't really belong to any group, and that's okay. Other people have their own reasons, but the only feeling of superiority I see is coming from the people who think HV is a waste of time. Over and over I see this same argument: why not learn a different (read: useful) language? Many of us already study other languages, so what's your point? Let people like what they like. Wouldn't that be more welcoming? So... you wanted the guy who basically created High Valerian to work on the Arabic course instead? I mean, he technically could do it; as far as I know David J. Peterson is fluent in Arabic. Please give me 6 lingots I'll give you as much as 115 more, please. hi there i am a student from moberly and i dont really get the point on why you are telling us this so peace out!!!!!!!!!!!!!! High Valyrian in the Incubator?! High Valyrian Now In Beta! The Welsh course - with audio!